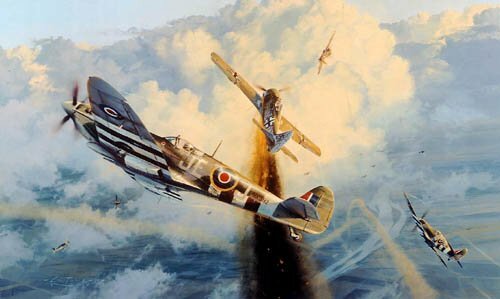 Overall Print Size: 33" x 23"
Leading 433 (Canadian) Squadron, top Allied Fighter Ace Johnnie Johnson -Greycap Leader - has already bagged an Fw190, and is hauling his MKIX Spitfire around looking for a second in heavy dog-fighting over the Rhine, September 1944. In the distance more enemy fighters appear; they too will receive the attention of the Canadians. Each copy of Greycap Leader is signed by no fewer then TEN of the leading fighter pilots who flew Spitfires with the Canadian Squadrons in Europe during World War II.